Since the Masterpost has gotten a bit unwieldy, despite my best efforts, I decided to collect all the key interviews/publicity events in a slightly different format: Staff and Cast (and others!) in alphabetical order. NB: Do remember that Kubo has the most publicity engagements because she is ON the publicity team. Yamamoto, as the DIRECTOR, is still the most important voice on this project, and we are all hoping that she’ll do at least one commentary and a few interviews once she has a bit more time. Until then, however, Kubo does speak for her as her fellow writer, and as a representative for the entire creative team. 2016-10-31 Interview from KISS&CRY special Dance! Dance!! Dance!!! NB: On the “partners” vs. “buddies” controversy — I personally would have used “partners.” However, the ‘translation’ that Tora was probably reacting to was this (screenshot in case the link is ever broken). NB: The credit is 画面設計. Based on other research I’ve been doing recently, I believe it has something to do with designing the backgrounds that the key animation will be composited with. But it’s something I have to read up on in greater detail. 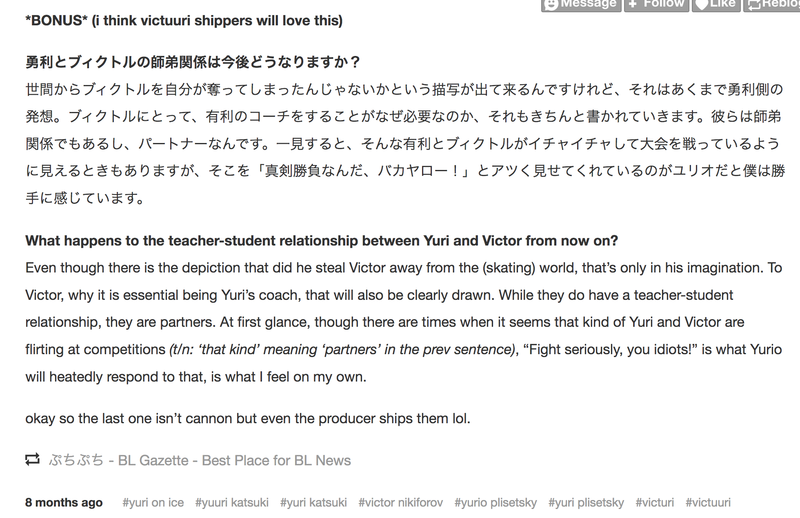 NB: There is at least one detail in the Otaquest interview that does not match what Yamamoto and Kubo have said in their Japanese interviews. They talked about meeting the cosplayers in the Czech Republic in their Fanbook roundtable, but said that it was the cosplayers who asked “Do you know of Yuri!!! on ICE,” and they just replied “We do,” without revealing their identities. Yamamoto said pretty much the same thing in her Guidebook solo interview. 2017-10-?? Cast Comments on the official website (translated by Justin Luster for CR).